Daegu to Rise as a Cluster Center of Korea’s Energy-Machinery-Robotics Industry this Autumn! of Korea’s Energy-Machinery-Robotics Industry this Autumn! 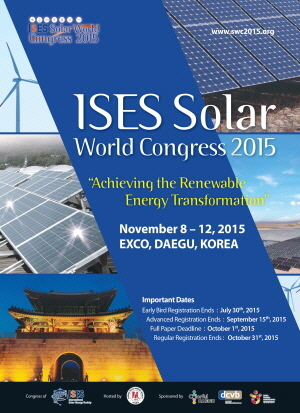 The world’s most reputable solar energy congress, International Solar Energy Society (ISES) congress, and world’s best renowned event for international clusters, TCI (The Competitiveness Institute) conference, will be hosted in Daegu for the first time in Korea in November 2015. These events will help promote Daegu’s excellence in renewable energy, and are also expected to help expand the ‘creative economy’ boom - South Korea’s newest economic development plan - Korea wide using Daegu/Gyeongbuk’s start-ups and industrial complexes as their anchor. The keywords - great leap forward in renewable energy, and an innovative construction of industrial complex - describe the city of Daegu’s efforts to develop into a ‘sustainable solar city’ and to become the center for Korea’s innovative/creative economy. Daegu Metropolitan City is also under preparation for hosting of ‘Daegu International Robot Industry Expo’ and ‘Daegu International Machinery Industry Expo’, the city’s iconic exhibitions, in November. Robot industry is seen as a new promising industry in Daegu, while machinery and components & materials industry has always been one of Daegu’s strong areas. Combining these two industries into one is a new effort to maximize synergy effect to promote Daegu as Korea’s top industrial city. Daegu’s hosting of the first International Solar City Congress in 2004 and the International Solar City Secretariat has served as a stepping stone to become a world renowned solar city. Also, the city’s energy industry has played a significant role in the city in terms of constantly hosting the Daegu International Green Energy Expo. Such tireless efforts from the city has resulted in another hosting of the 2015 ISES Congress. Daegu Metropolitan City has hosted the 2013 World Energy Congress (also known as the ‘Energy Olympics’) successfully, and was recently designated as the hosting city for the 2021 World Gas Congress. The city’s goal is clearer than ever - to make Daegu a central hub of world energy conventions. * The Competitiveness Institute (TCI) congress to bring 450 industrial cluster experts from 50 nations. 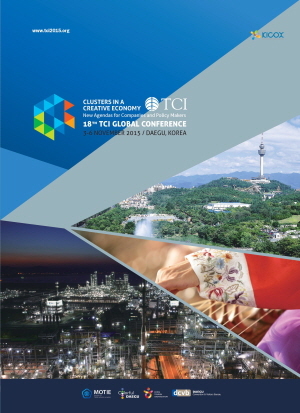 The 18th TCI Global Conference will be hosted in Daegu EXCO from 3 to 6 November. Hosted by Ministry of Trade, Industry & Energy, and supervised by Korea Industrial Complex Corporation and TCI Network (International organization), 450 industrial cluster experts from 50 countries will participate in this event. Founded in 1998 for strengthening and exchanging cluster based competitiveness, TCI has 9,000 experts from 110 countries worldwide as its members. This conference will serve as a venue to promote the achievements of Korea’s industrial cluster policies to the world while engaging in various cooperation activities. A conference and cluster tour, with the theme of ‘Creative Economy and Cluster: Business Model and Policy Agenda’, will be conducted in Daegu. Guided tours will be provided to places such as the Daegu National Industrial Complex, the Daegu Textile and Dyeing Industrial Complex, Steel & Iron Industrial Complex (Pohang), and Electronics Industrial Complex (Gumi) - in an effort to strenuously promote Daegu as the central hub of Korea’s industries.